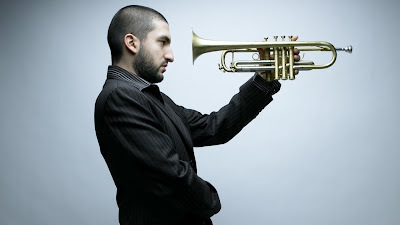 Ibrahim Maalouf plays a four-valve trumpet — most just have three. The extra valve, attached to the button a trumpeter pushes down, allows the Lebanese musician to play quarter-tones — the notes between notes that characterize Arabic "makams." "The makams are scales and modes with quarter-tones and three quarter-tones intervals," Maalouf says. "This is something that you cannot find in Occidental music." Maalouf credits his father, the renowned Lebanese classical trumpeter Nassim Maalouf, with the innovation. "This trumpet that he invented is really pure genius. He invented the only Arabic instrument in which you blow, that allows you to play all modes, all scales, in all the tonalities," Maalouf says. "This does not exist in Arabic music. It's not only a trumpet that makes you play quarter-tones. He invented a way to blow in the instrument. He invented a new way to play the trumpet." Maalouf says there are many links between Arabic and Western music. He says when he's playing jazz, he can incorporate Arabic scales thanks to one specific similarity. "There's this note that we actually call 'the blue note' and I believe it's a heritage from African music," Maalouf says. "Those notes that are right in the middle, between a note and another note, those are 'blue notes' that you bend with the lips. Those are quarter-tones. From these kinds of scales I can switch to music that is very close to Arabic feelings." Ibrahim Maalouf's latest project is his first devoted exclusively to jazz: a score he was commissioned to write for the 1926 silent film by French master René Clair, The Prey of the Wind. Maalouf's inspiration was another trumpeter's score for another French film: Miles Davis' music for the Louis Malle film Elevator to the Gallows. "This music really, really has been probably one of my favorite musics for years," Maalouf says. "So I used this opportunity to compose the music of a very, very old French movie of the '20s, and I decided to compose something that would sound a little bit like the music of Miles on his movie." According to John Schneider, Maalouf crosses the boundaries between jazz and Middle Eastern music very elegantly. Schneider is the founding director of MicroFest, the country's largest microtonal music festival. "He's using those seven notes in the scale but when it comes time for him to improvise, he strays off the path just a little bit — he's breathing," Schneider says. "It's like spicing food in a particular way. So sure, we've all had chicken, but tandoori chicken is different from Mexican chicken or Chinese chicken, right? It's still the same meat, but what you do with those spices make all the difference. "It's almost like an accent, too: an English accent, an American accent, a Southern accent," Schneider adds. "The words we recognize, but how they're presented, slightly different. The man obviously has Lebanese music, traditional music, in his ear. So when it comes time for him to ornament, he uses those strange, wonderful spices to get them an odd quarter-tone tinge and that gives you that flavor of the Middle East." Maalouf moved with his family to Paris when he was a small child. His father still lives there and, according to Maalouf, is not too keen on his son's current career path. "In some way, I think that he believes that I should have taken some other way," Maalouf says. "Some other direction that would have been what he wanted me to do when I was young." He says his dad is not the only one. When he visits older musicians in Morocco or Cairo, he's always confronted with the same reaction to his music. "So I usually take my trumpet off my bag and I play him this very, very old kind [of] traditional improvisation," Maalouf says. "And they start usually saying, 'Oh this is what I prefer and this is what you need to do.' And I say, 'You know, I know how to do that and I love to do it. Today, I want to mix my music to the new world, to the new scene. I want to meet people who are discovering new colors — to participate, to create new music. I don't want to remain in an old white and black postcard.' Then, after this discussion, they usually understand what I mean and they say, 'You know what, you're right. Don't listen to your father. Do what you want.'" Ibrahim Maalouf says he may not be playing or recording classical or traditional Arabic music, but he's still holding on to the heritage he received from his father.